Soccer Jersey Give-Away–Happy New Year! Roots Ethiopia is celebrating the Ethiopian New Year and the Ethiopian Soccer Team win against Central Africa with an Ethiopian Soccer Jersey Giveaway! Roots Ethiopia is going to celebrate New Year’s with a JERSEY GIVE-AWAY! Everyone who donates to ANY of our projects for ANY amount will be entered into the draw. We will host a random draw using random.org on Saturday, September 14th at 9 P.M. Central. So come on, win this beautiful jersey! 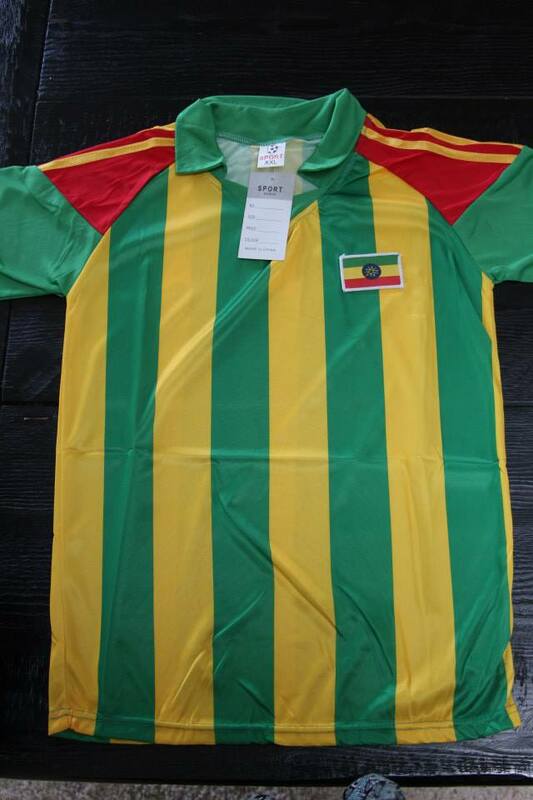 (Adult L, Adidas tags, if you know shirt sizes in Ethiopia, this is more like an adult S and/or a children’s XL). You can donate on our secure server HERE for any of our 3 core programs (IGA’s, School Sponsorships, and our General Fund). You can also donate HERE for our special project in Amacho Wato. Choose your favorite program and don’t wait — you have one week! Do you want to learn more about the Ethiopian New Year? September 11, 2013. Ethiopian New Year, also called Enkutatash or Ri’se Awde Amet, is a significant holiday for Ethiopians. New Year’s Eve is sometimes spent attending the church or mosque. On New Year’s Day, there is much celebrating, good food, family, and neighborhood friendliness. If a family can, they will purchase new clothes for their children. The children will get together and go from home to home singing and collecting coins (birr). The girls sing in groups during the day, followed by groups of boys on New Year’s night. Evening ends with coffee and children who have spent their coins on candy at the local suk. The holiday occurs on September 11 in the Gregorian calendar, except for the year before each Western Leap Year, when it occurs on September 12. CONGRATULATIONS TO STACIE D. — THE WINNER OF OUR JERSEY GIVE-AWAY! Thank you to everyone who supported this campaign. We appreciate your support of our program and of Ethiopia’s national soccer team!